semi-subversive in Los Angeles – most of this is true. I used to live in a Spanish style duplex near the Beverly Center. Whenever anyone asked where I lived I would say Hollywood because it was a million times cooler than saying “near the Beverly Center,” or “between West Hollywood and Beverly Hills.” When we hear Hollywood we think of kids on the street and drugs and getting drunk at the Rainbow with Guns n Roses before they were Guns n Roses. Tourists hear Hollywood and think of glamor and movie stars, I think. When we hear “Beverly Center” we just think of Guess billboards and that guy who killed himself by jumping from the parking structure. I was a student at UCLA when I lived in that Hollywood apartment. I took Burton Way to Wilshire and sneaked into lot 3 by tailgating the car in front of me so I could make it through the gate before the arm dropped. It always worked, and it was always an adrenaline rush: what if the arm came down on my car? what if the driver of the car in front of me was looking in his rearview mirror and got mad that I was using him to break into the parking lot? What if I wasn’t fast enough and the arm came down, blocking my entry, and there was a line of cars behind me? Sometimes I’d have to wait for so long for a car to enter the parking lot that I’d be late for class. I forgot who taught me that trick. It also involved the one-time (per semester) theft of a hanging parking pass from an unlocked car. I justified it because they could get a new one at no charge and it was the stupid bureaucracy that had rejected my request for the pass in the first place. I was a revolutionary. When I started grad school I had moved into a condo near Pico and Fairfax. There was no way I could spin that one as being in Hollywood. I lived there with my boyfriend, and we always had people over and we were always drinking. I did every drug possible in that condo, and my boyfriend just loved me, oblivious to the changes in my personality and the shadier and shadier characters lounging in the living room when he got home from work. I hid it well. We lived there during the Rodney King riots. We called it a rebellion. When my mom urged us to come to her house in Santa Monica for safety we said that would be “white flight” and we wanted to stay with the people. I heard a guy from the apartment building next door yell “I got a new air conditioner! We won’t be hot this summer!” The Indian restaurant we liked on the other side of Pico burned down. The 7-11 next door was on fire. The same neighbors who bragged about looting organized the neighborhood to get water to throw on the 7-11. We didn’t volunteer. I can’t remember why. Maybe it was because we were the only white people in that neighborhood. I’m sure that wouldn’t have fazed Daniel. It must have been me. There was supposed to be a curfew. The TV wouldn’t stop showing clips of that truck driver being dragged out of his car and getting beaten up. 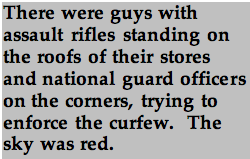 There were guys with assault rifles standing on the roofs of their stores and national guard officers on the corners, trying to enforce the curfew. The sky was red. We used to like to say that the only way to change oppressive regimes was through violent revolution. L.A.’s “civil unrest” was confined to a few days, suppressed as quickly as possible, spun into an anger that was supposed to be a result of the King verdict alone. In the end, nothing really changed. Eventually we went to my mom’s house. As we drove west each neighborhood was darker and quieter than the previous one. By the time we were west of the 405 it was like a curtain had fallen, insulating us from the heat and anger of L.A. If we changed the radio station and listened to music, we could pretend that the heart of our city wasn’t throbbing with anger and untreated disease, that no one was hurting, that this quiet seclusion is how it would always be: dark and starry and soft and safe. We brought the cat because we weren’t sure how long we’d have to stay. Next Post Perfecting the Addiction. Thank you so much, Kenneth. Loved reading this the first time and it holds up. Good stuff! As a non-native I tend not to think of Pico as that far South, but I guess it really is huh? Right there next to the 10. Thanks for the story!